Glen Gene Grill is a classic American restaurant, known for its fast causal dining, fresh flavor, and historic local roots. The menu features a great selection of home grown favorites. We take the time and effort to prepare your meal by using simple, honest ingredients. Always fresh ground chuck burgers. All-Natural, farm fresh chicken and produce. Butcher block steak, 100% real cheeses, and tender meats sliced daily. Fresh baked breads, house-made salads, and hand spun shakes. You can taste the care that goes into everything we make. Whether your new to the neighborhood or been “Grilin’ Since ’78”, you're always family here. We take our food seriously and have so much fun with it. Family owned and operated for nearly 40 years, Glen Gene is a Chattanooga staple that is truly a part of its history, tradition, and culture. It may be hard to imagine now, but at one time Glen Gene was exclusively a sandwich shop located in the heart of downtown Chattanooga. An awesome sandwich, chips, and coke was the only way to go back then. In some ways not much has changed. 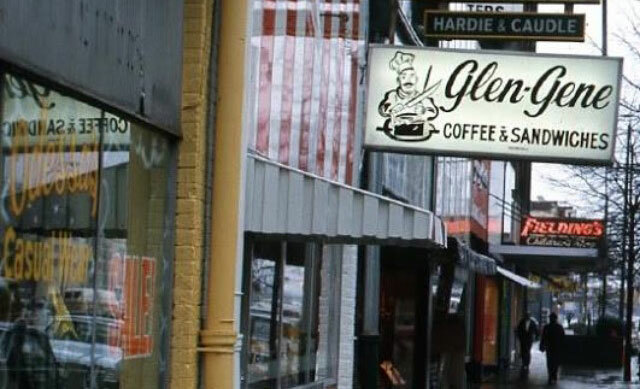 The core principles of caring, responsible, and authentic food that Glen Gene was found upon, are still here today. Our passion to strive for excellence, create delicious meals, and grow side by side with the great city of Chattanooga has never faltered. Hixson is now where we call home. We have created something we’re so proud of, and we know you will be, too, for years to come. So now when you're on this side of the river, don’t hesitate to grab a classic favorite or try something new!